The Best Beef Tomato is cooked at Kung Fu Thai and Chinese Restaurant in Las Vegas Nevada. 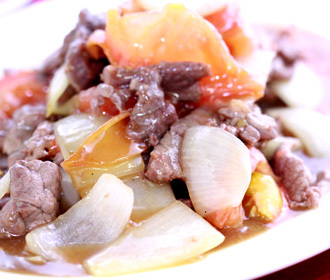 Our Chefs starts off with slices of tender cut juicy Certified Angus® Beef along with slices of fresh red tomatos, fresh cut white onion squares all stir-fried in a rich thick brown oyster sauce based gravy. Served with a small cup of gourmet Steamed premium Jasmine Rice.